Night had fallen by the time I staggered, weary and starving, off the train in London. The city rolled out in front of me in one huge dark smoky mass—I had no idea where 10 Hampson Street might be. I had a few coins left in my pocketbook, and as I hailed a cab I prayed it would be enough. I really didn’t relish having to yank a pearl off my grandmother’s necklace just to pay for a taxi ride. Maybe I shouldn’t have left that waitress a whole pound . . . But I wasn’t sorry. The driver took me to what he said was Pimlico and dumped me at a line of tall row houses. It had started to rain in earnest. I looked around for my hallucination, but there was no flash of blond hair. Just a dark street, the spitting rain, the worn steps of number 10 climbing to a dingy peeling door. I hoisted my case, clambered up, and banged the knocker before my courage deserted me. No answer. I banged again. The rain was falling harder, and despair rose in me like a wave. I pounded and pounded until my fist ached, until I saw the minute twitch of the curtain beside the door. To my surprise the handle turned, and I flew inside, falling at last off my impractical shoes. I hit the floor of the dark hallway on my knees, tearing my stockings, and then the door banged shut and I heard the click of a pistol being cocked. The streetlamps sent a blurry light through the curtains, half-illuminating the dark hallway. I could see a tall gaunt figure, a straggle of hair, the fiery end of a lit cigarette. The gleam of light off a pistol barrel, pointing straight at me. “I don’t have any.” She turned and made her way back down the dark hall, walking long-strided and careless. Her bare feet looked like an eagle’s claws. She weaved a little as she walked, the Luger swinging freely at her side, and I saw she still had a finger through the trigger. Crazy, I thought. The old cow is crazy. And her hands—they were monstrous knobbed lumps, every knuckle misshapen and grotesque. They looked more like lobster claws than hands. “Keep up,” she said without turning, and I scurried after her. She struck a door open and flicked on a light, and I saw a cold sitting room—a mess of a place, grate unlit, drapes drawn so no chink of light could come in off the street, old newspapers and dirty tea mugs lying everywhere. I pulled up a hassock and sat down, suddenly uncertain where to start. I’d been so focused on getting here, I hadn’t thought how exactly I should begin. Two girls times eleven summers, divided by one ocean and one war . . .
Late!y I'm e been reading a lot of The WWII books. This sounds like a wonderful read for me. Thanks for the post. 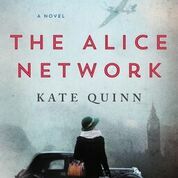 Spies, plus WWII, whats not to love! I am really looking forward to this, thanks for sharing the excerpt! Doesn't it sound terrific? It's on my must-read list for this summer! Thanks so much for the excerpt and the review. I am intrigued and looking forward to reading a story that seems to have some substance to it.